All Lulu Ceramics work is dinnerware ready. Made from Cone 6 clay for durability. Snack size plates, salad, dinner, jumbo dinner or large serving platters... the right plate makes food look appealing and appetizing, enhancing your beautiful meal. Mugs and tumblers in a variety of designs and sizes...espresso to large cafe au lait. Hand stamped for a custom touch. Dots, stripes or blends of colors to pop in your home. The right mug can start your day with a smile and make your coffee taste... oh so good. 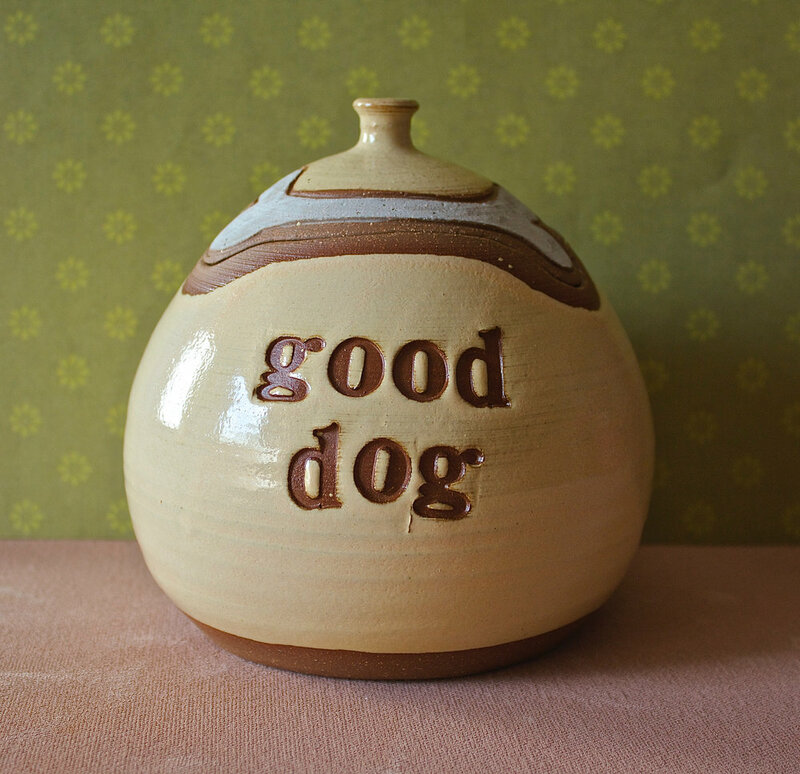 Cookies, bones, treats- whatever you like to call them, doggies and kitties love them and come running at the sound of jar opening. Pick a saying or have your jar personalized with your precious one's name. Hand stamping adds a personal feel to mugs, dinnerware, pet dishes, wedding, or baby bowls. Add a name. Mark your territory, pick something mysterious and keep them guessing. Cereal, soup, rice, heaps of ice cream- everyone has a favorite shape and size for favorite foods. Lulu Ceramics bowls range in size from tiny condiments to large serving bowls and styles of deep dish and wide lip. Offering personalized bowls with hand stamping and glaze color of your choice. For everyday or an event, interesting serving ware can make a meal special. Serving Trays for bread with olive oil reservoirs, sushi with wasabi and ginger, cheese and crackers, veggies and dip, chips and salsa.......hmmmm. Cream- n- sugar sets, and butter dishes make a lovely presentation for guests. Oval and large Square serving platters highlight your main dish. Dedicate a planter to your favorite herb. Give your plants or flower arrangement a container that compliments its natural beauty. Raku is a a dramatic firing method involving lots of fire and smoke and often characterized by a crackle glaze. Vessels are glazed to hold water but with all raku, placing a vessel on a tile or coaster is recommended as raku pieces tend to sweat.